Suspended energy recovery air handling units. Maximum air flow up to 500 m³/h. Air handling units for efficient supply and exhaust ventilation in flats, houses, cottages and other buildings.Reduction of load for air conditioning systems in hot climate and heat losses in cold climate conditions due to heat and humidity recovery.Quality air exchange control for arrangement of comfortable indoor climate.Compatible with round Ø 100 or 150 mm air ducts. The casing is made of polymer-coated steel panels, internally filled with 5-10 mm thick expanded polyurethane layer.The bottom service panel is used to access the filters and the heat exchanger for maintenance operations.The spigots are located at the sides of the unit and are equipped with rubber seals for airtight connection to the air ducts.The casing is equipped with fixing brackets to suspend the unit to the ceiling. Asynchronous external rotor motors are used for air supply and exhaust.The units are equipped with single-phase three-speed external rotor motors with centrifugal impellers and forward curved blades.Integrated motor overheating protection with automatic restart.Ball bearings ensure long service life.The impellers are dynamically balanced.Featured with reliable and low-noise operation. Two built-in G4 and F8 filters provide efficient supply air filtration.The G4 filter is used for extract air filtration. 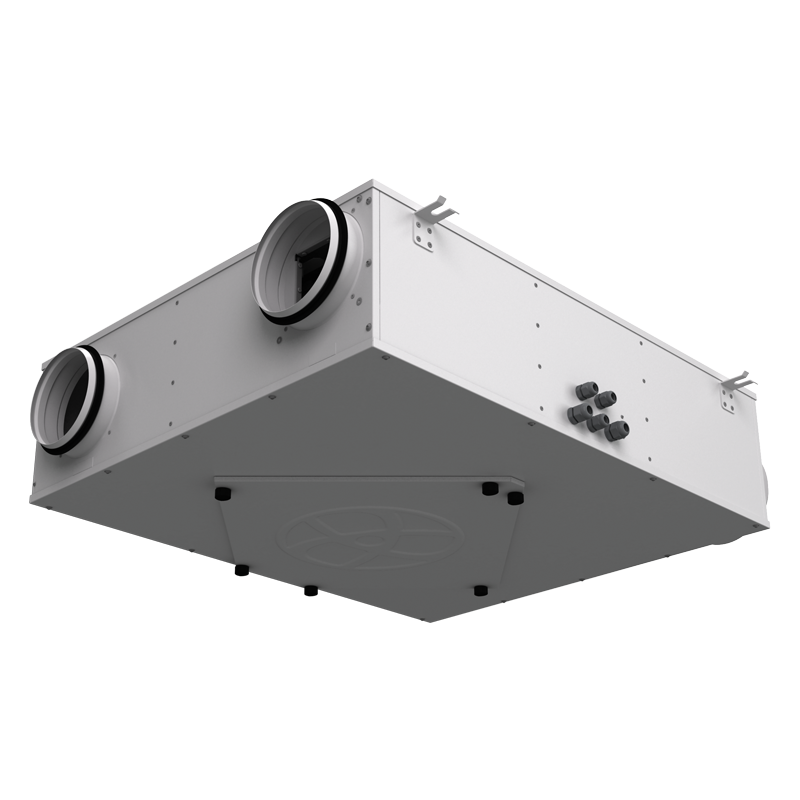 Due to a low casing height the air handling units are a perfect solution for space-restricted installations above suspended ceilings.The unit mounting position must provide access for service maintenance. The unit is equipped with a plate crossflow heat exchanger made of polymerized cellulose for enegry (heat and humidity) recovery. 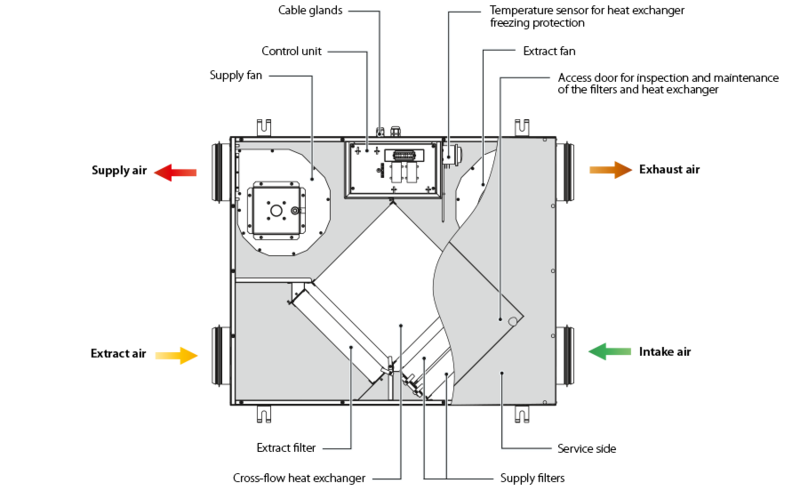 Due to humidity recovery condensate is not generated in the enthalpy heat exchanger.The air flows are completely separated in the heat exchanger. Thus smells and contaminants are not transferred from the extract air to the supply air.Heat recovery is based on heat and/or humidity transfer through the heat exchanger plates. In the cold season supply air is heated in the heat exchanger by transferring the heat energy of warm and humid extract air to the cold fresh air. 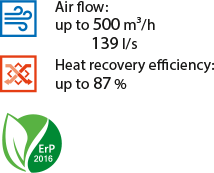 Heat recovery minimizes ventilation heat losses and heating costs respectively.When the indoor and outdoor temperature difference is insignificant, heat recovery is not reasonable. In this case the heat exchanger can be temporary replaced with a summer block for the warm season (available as a specially ordered accessory). The units have integrated control system based on the mechanical three-speed speed switch CDP-3/5 (KOMFORT ERV D... S3) or sensor three-speed speed switch SGR-3/1 (KOMFORT ERV D... S4), and power cable with mains plug.The control unit is integrated in the unit casing.The power and ground cables are connected to the control unit via the cable glands on the side of the unit. FREEZE PROTECTION The freeze protection of the heat exchanger is activated by shutdown on the supply fan as follows: in case of freezing danger communicated by the temperature sensor the supply fan turns off for the time required for defrosting of the heat exchanger with the warm extract air flow.